The Super Air Nautique G25 has now become more than just a boat. Its wakes have flooded into the dreams of every rider in the world as a gateway to new possibilities and has pulled our entire sport into a new era of innovation. When we released the G-Series we knew that it would change everything, but we had no idea it would be taken this far. 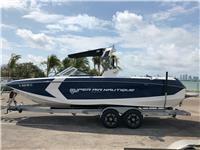 I am interested in your 2019 Super Air Nautique G25 and would like more information. Please let me know. Thank you! Great condition. Practically a new boat with low hours. Comes with boat trailer and cover.